The Seasons Series :: "Winter"
The inspiration for "Winter" or in Hebrew "חורף" comes from the unique sights and smells of this frosty season. 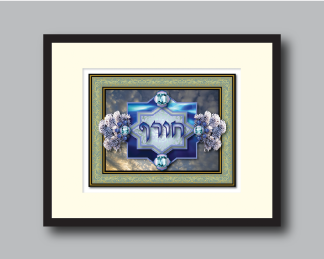 In the background, an alpine blue embellished frame surrounds a dramatic blue, cloud filled sky. 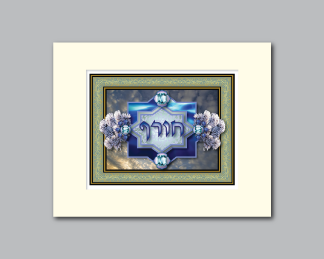 Superimposed is a window filled with celestial blue, symbolic of the divine presence that, in every moment, orchestrates the continuous miracle of life. On each side, frost encrusted thistles, and blue jewels depict the quintessential symbols of this season. Stylized flowers adorned with sparkling sky colored jewels again remind us of the divine blessings that unfold and evolve as we move through each moment, day, season and year, only to begin the year again anew. The inspiration for “Abundance” comes from a desire for us to stop and appreciate the gifts that make our lives rich and fulfilling and to remember the source of their origination. Abundance or in hebrew “Shofah” (שפע) is reflected in every corner of the art piece. Each is a different aspect of what brings happiness to the human experience. 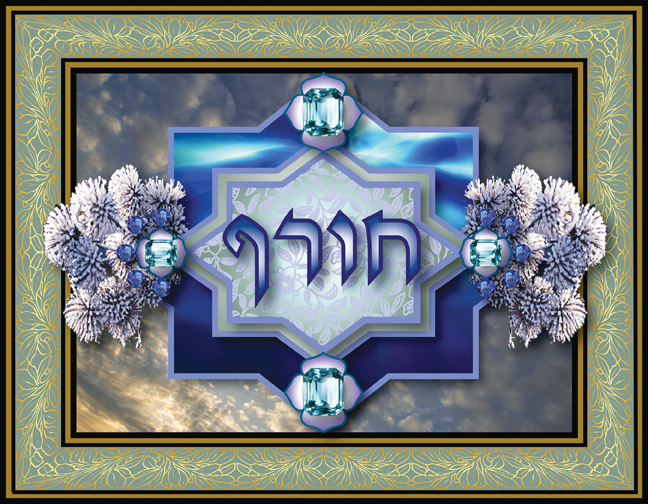 The upper left represents Torah and intellect and satisfies our desire for learning. The upper right represents our emotional needs for human touch and love. The bottom left represents succulent, fresh and healthy foods that sustain our physical bodies. The bottom right corner reflects jewels and financial abundance. The center area radiates out with green petals (signifying growth) from a blue celestial center. This a reminder that the source of our abundance comes from our Creator. The grapes and regal cup are symbols of G-d’s desire for us to rejoice in, and enjoy the gifts he/she offers.